No matter how friendly your hens are, or how much you handle them and they love to sit in your lap, they seem to have a sixth sense, and as soon as you try to administer medication, they turn into squirming, wing-flapping dervishes. 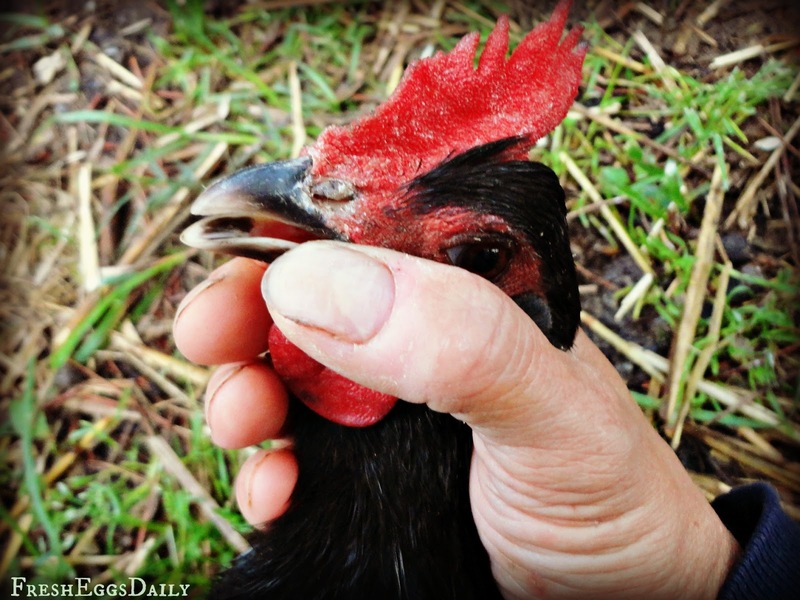 You might get away with sitting and holding your ailing hen, petting her and then quickly opening her mouth and dripping drops into her mouth once or twice, but by day three, good luck even catching her. Obviously chasing a sick chicken around isn't optimal - either for her or for you, since you want to keep her calm - and many times even in isolation she will manage to squirm and evade your best efforts. Often a very sick chicken will hold still, but as soon as she begins to feel the slightest bit better, she might still be needing medication but will be much more feisty and harder to hold. In addition, many medications need to be administered orally using an eyedropper, but you need to be very careful not to let the liquid go down the windpipe which can cause the hen to aspirate and possibly die. That means pushing the eyedropper further down the throat which isn't pleasant for the patient. 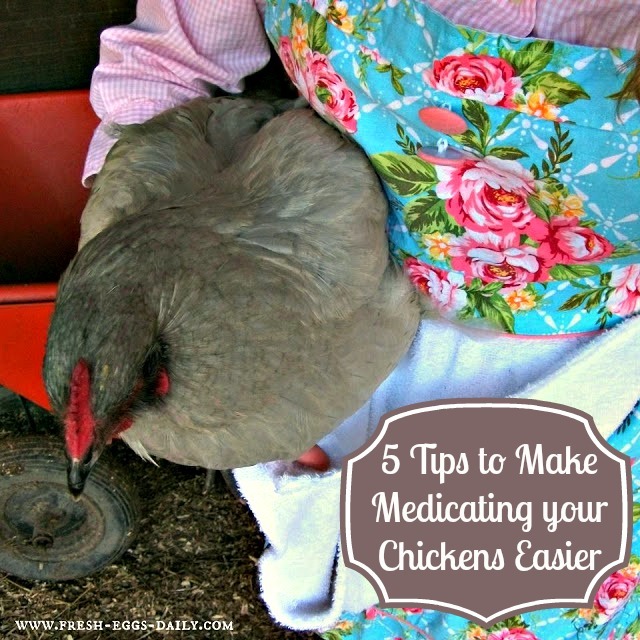 Knock on wood, I don't often deal with sick chickens, but the few times I have, I have been home alone, so out of necessity I've developed an easy method to medicate even the most stubborn, unruly chicken. 1. Flip her Over For drops administered by mouth, such as Nutri-Drench, kneeling on the ground, hold your chicken around the middle keeping her wings against her body, flip her over and place her on your knees. With the fingers of one hand, gently press each side of her beak near the hinge until she opens up and then drip the drops in with an eyedropper or syringe with your free hand onto the roof of her mouth. 2. Dab under the Wings VetRX, which is an all-natural cure for respiratory issues and probably the medication I use most, can be administered by mouth, via drinking water or under the wing. 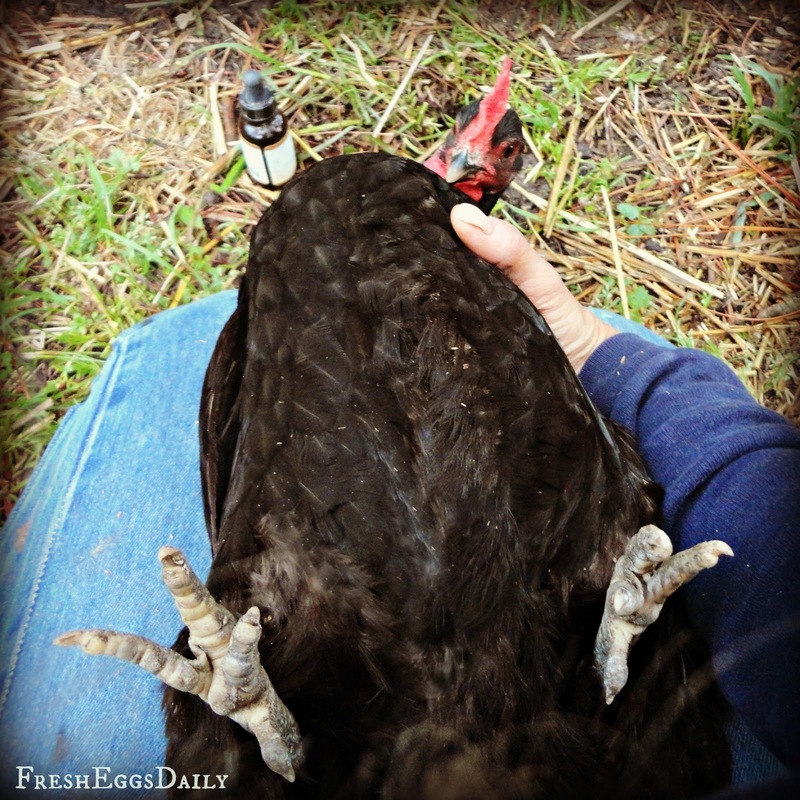 I find that a few drops under the wing can be applied quickly and easily, usually without your chicken even realizing she's being treated. 3. Q-tip to the Nostrils VetRX can also be administered by dabbing a bit on each nostril. Kneeling and holding your chicken between your knees, petting her with one hand while dabbing each nostril with a VetRX-drenched q-tip is simple and will fool even the most suspicious patient. 4. Add Drops to Drinking Water Since all of the remedies I use are natural and holistic, I can just add a few drops of essential oil or medication to my flock's drinking water. They won't hurt the healthy hens in the last bit, but their effects will benefit any ailing hens. If you're not sure if they are drinking, hold the hen and dip her beak into a small dish of water/medication, as well as adding the medication to the general population drinking water. 5. Handle your Hens Often Since I make it a point of picking up my chickens, walking around carrying them, examining their eyes, vents, feet, etc. and petting them often, I can easily grab one and medicate her before she even realizes this isn't is regular petting session. This is very important especially when you have an injured hen that she is comfortable being held. I hope that these few simple tips will help next time you need to administer any medication. So totally helpful. Thank you for this!